The first meeting of the Alumni Association of Sir George Williams College was held on October 27, 1937. John P. Kidd was the first president. 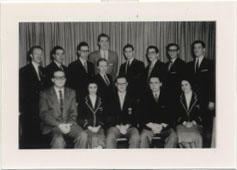 The Association of Alumni of Sir George Williams College was incorporated in the Province of Quebec on September 16, 1957. Sir George Williams College became Sir George Williams University in 1959, and the organization's name changed to the Association of Alumni of Sir George Williams in 1961. Following the merger of S.G.W.U. with Loyola College to form Concordia University in 1974, the Alumni Association of Sir George Williams renewed its constitution. The objectives of the Association are to encourage the fellowship of graduates from Sir George Williams Schools, College, and University, through social, educational, and cultural activities; to establish and maintain a link with all graduates; to promote the interests of the university through alumni involvement in its governance; to raise funds and recruit students; to develop an awareness by the students of the university in the association by the furthering of student welfare; to promote the establishment of chapters of the Association; to strengthen the relationship with the Loyola Alumni Association and the Concordia University Alumni Association, with the intent to coordinate the activities of the associations, and to participate in the solicitation of funds and to promote a common interest by all alumni/ae in the university. The fonds provides information on the administration, awards, and activities of the Alumni Association of Sir George Williams University and its members. The fonds consists of minutes, correspondence, constitutive documents, graduate and member lists, clippings, photographs, job descriptions, financial records, and documents related to fund-raising, homecoming and social activities.